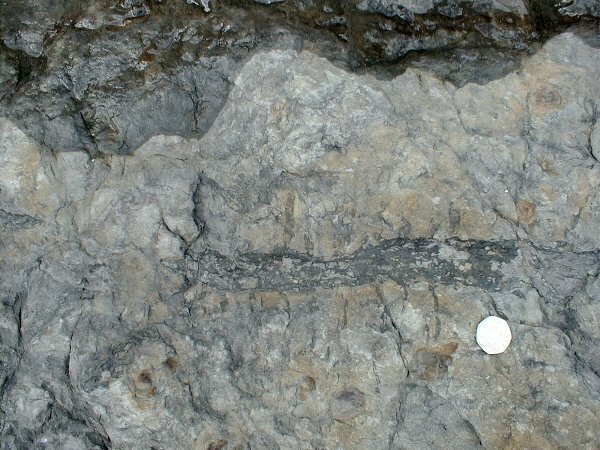 Horizontal Stigmaria root in sandstone palaeosol. View shows the top of the palaeosol, immediately below a thin coal seam (not seen here). The root system is preserved as a thin carbon film, filled with sandstone. Small roots are perpendicular to the main root: move your cursor over the image if you can't see these. The main root of the plant grew horizontally in the soil. What does the nature of the root system indicate about the environment?